Poynt CEO says "We are continuing to operate, grow and develop. Nothing really has changed." Earlier this month, Poynt issued a press release stating that they had filed under the Bankruptcy and Insolvency Act. While it was easy to misread the release itself, many (CB included) understood the information to mean Poynt was filing for bankruptcy -- this thankfully isn't the case. Poynt is the same as it ever was and won't be disappearing any time soon. Yesterday I had a chance to chat with Poynt CEO Andrew Osis and he was kind enough to fill me in and bring me up to speed on what's happening at Poynt. First, the good news. Poynt isn't going anywwhere. The company had actually filed for creditor protection which -- as far as end users are concerned -- doesn't change anything. Poynt is still going as strong and Andrew assured me that "We are continuing to operate, grow and develop. Nothing really has changed." Poynt is currently available in nine countries on multiple platforms and adding over 20k users a day. 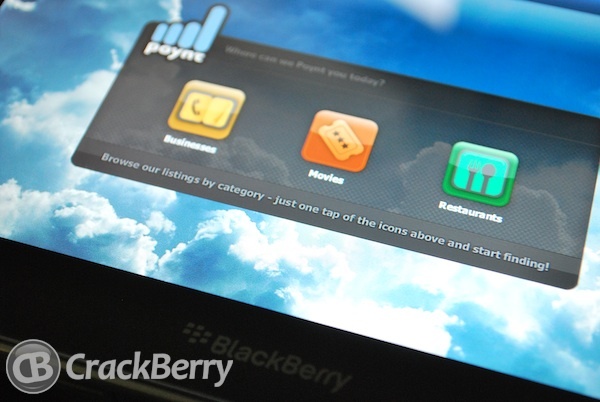 As far as BlackBerry 10 is concerned, Poynt will be there. It won't be just a straight port from the BlackBerry PlayBook version either. I was told they want to continue the great releationship with RIM and while a bit bummed about the delay, are still working to bring a custom Poynt experience to BlackBerry 10 devices.